In 2008 the Town of Stephens City celebrated its 250th birthday. 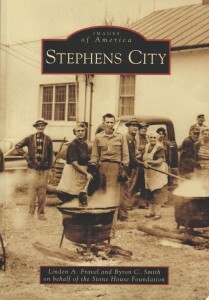 As part of the commemorations, Arcadia Publishing released Stephens City as a new addition to its Images of America series. Authors Linden Fravel and Byron Smith of the Stone House Foundation utilized a rich collection of historical photographs, paintings, drawings and maps of the town to reveal the colorful story of Stephens City and its people from its earliest days in the 1700s to the beginning of the twenty-first century. The book also includes an introductory text that outlines the early history of the town before the advent of photography. Pictures of people and places from the town’s past grace its pages. These images include photos of Main Street as it appeared over 100 years ago with buildings that are now gone, or much altered. Whether you are a former resident who moved away long ago, a transplant who has recently moved into the neighborhood, or a lifelong native, you are sure to enjoy this book. This book is already available in its second printing. You can buy it at local stores, book sellers, or order a copy online from your favorite book retailer. Copies are also available from us here at the Newtown History Center.